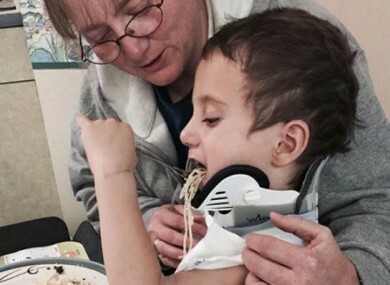 A FOUR-YEAR-OLD boy whose skull was severed from his spine in a car accident in Idaho last month is expected to make a full recovery, his family have said. The skull of Killian Gonzalez was internally decapitated in the crash, and the survival rate for such horrific injuries is low. However the quick thinking of a passerby may have saved the young boy’s life. Leah Woodward and her husband, an off-duty police officer, were the first to arrive on scene and smashed one of the windows to reach the young child. Speaking afterwards, Woodward said she fought the urge to cradle the screaming child and instead sat him up and supported his neck for half an hour until paramedics arrived. I’m trying to stay calm but inside I’m panicking. I’m thinking I don’t know what I’m doing, and it was the worst feeling I’ve ever had to not know how to help. The boy’s mother, Brandy, was also injured in the crash, which happened as they were on their way home from celebrating his fourth birthday. According to a GoFundMe page set up to pay for medical expenses for the Gonzalez family, Killian is making a full recovery. Killian is doing amazing everyone! His big brother and sister both came to see him today. Tomorrow morning he has OT [occupational therapy] and we are very excited. He is so excited to do stuff he hasn’t been able to. He gets so proud of himself. I love that he keeps pushing himself to do better. We have been in contact with their guardian Angel Leah Kaupanger-Woodward who was first on scene with her husband and held Killian’s C-spine the entire time. She is the reason Killian is doing soo amazing. Email “4-year-old who was 'internally decapitated' in horrific crash to make a full recovery”. Feedback on “4-year-old who was 'internally decapitated' in horrific crash to make a full recovery”.